This entry was posted in Uncategorized on August 26, 2014 by Mike Nash. Our clients LOVE reports. Dashboards, KPI reports, Timesheets – if it can be reported on, our clients have asked us at one time or another to do it. Successful businesses need to know where they are to figure out if they’re on track to get where they want to be. They need visibility of every aspect of their business, and that gives them control of their own destiny. However, most accounting systems or CRM systems for that matter don’t have great reporting. Are you getting the reporting you need? Account systems tend to be “accounting focused” – stuff your accountant or the Tax office needs. Knowing the current value of your plant and equipment isn’t something you need every day. Knowing if your sales team are performing, if telemarketing calls are being made, if targets are being hit – and the pipeline is full are. Tall Emu’s new KPI reporting system has been in sneak-preview mode at selected Managed Support clients over the past year and we’ve built on the fantastic feedback these clients have given us, to help get a nice, polished self-service KPI reports into version 3.1 of Tall Emu. Generate unlimited reports, and have them sent to selected staff members on a schedule as a PDF completely automatically. Report and target on any element of the data within Tall Emu (including accounting data). Report on ANY ELEMENT of your business – calls, companies, tasks, notes, tickets, opportunities, quotes, sales orders, stock, products, territories – even custom data sources that are created in your CRM can have KPI and Measurements written for them. The chart below is a sample showing the number of invoices issued per employee. It could just as easily be Gross Profit per invoice per employee, profit per invoice, value of invoices (total, average). The system will allow you to easily define if you have all employees on one chart, a separate chart – even exclude people from the report , only show the top ‘x’ staff members, or group people who may sell infrequently into an “other” category. Our KPI system has been built in such a way that it is easy for us to add new KPI on customer request – which is also quick and easy. Forget the fastest gun in the west! Do you have the fastest quoting process in the West? Every moment you spend preparing a quote and logging data is precious, especially if your client is waiting on the phone for a price. They can get impatient while you fill in your forms – after all they want the price – but you need their details to properly follow them up and close the deal. In Tall Emu v3.1 , we’re pleased to announce the fastest quoting system ever. While a new prospect is on the phone our new system will let you gather the needed company data, log the call, check stock availability and process the quotation in record time. If the quote is accepted you can convert it to an invoice, take payment via credit card – and arrange shipment. All in one screen. All in Tall Emu. What’s more , the feature connects with many phone systems – existing customers can be identified by their phone number preparing the screen for immediate use. New clients have their number logged automatically – making sure that next time they call you know who they are. On the screenshot above, we have created two contacts – John and Jane Sample; their company record too – and we have captured their suburb and state so we can give them an instant freight quote. 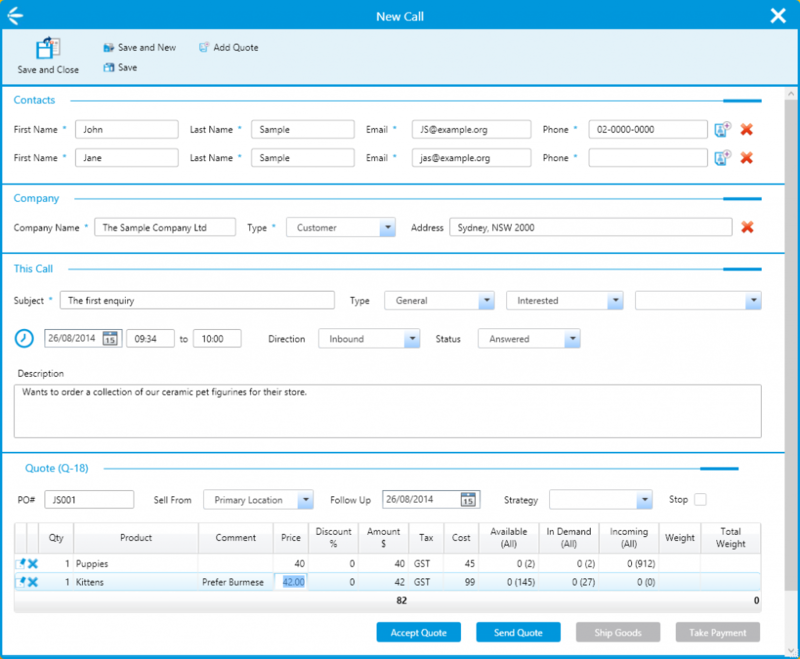 The call record lets us record outcomes of calls – and a quote can be generated inline. With a single click, we can send the quote – or accept it – and, once accepted we can even arrange the shipment (entering in the full address) as well as accept payment by credit card and give the customer their receipt number! If the quote doesn’t proceed immediately , you can specify a follow-up strategy which which will remind you to follow it up later (or do it for you, depending on your settings). 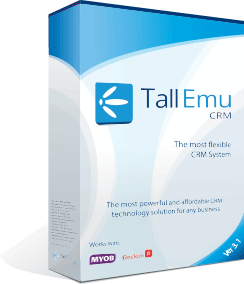 If you’re interested in streamlining your quote process in CRM to help you sell more, get in contact with Tall Emu today. If your business is involved in importing and wholesale of goods, Tall Emu v3.1 has some awesome new capabilities that will save you huge amounts of time and paperwork. Issue and send a purchase order from Tall Emu based upon sales history, stock requirements, supplier minimum orders and more. Ordering rules can deal with seasonal items such as Christmas lights, or items stocked all year around. The Purchase Order rules can be customised on request to suit your business. Tall Emu will propose a suggested purchase Order which you can modify, send to the supplier and automatically follow up to verify prompt shipment. The Purchase Order can be issued in any currency and transferred to your accounting system as required. Your supplier contacts you and provides a packing list which tells you what items are inside the container. This might include items over a single Purchase Order, or partly-shipping several purchase orders. The packing list is loaded into Tall Emu against an inbound Shipment. The shipment tracks documentation related to your import, including freight quotes, bills of lading and other important documentation which puts all of the needed paperwork close to hand. If you operate multiple locations, you can even specify a landing port and then define which other locations goods will be forwarded to post-arrival. Import duties and freight costs as well as exchange rate are also stored against the inbound shipment. At any stage from Purchase Order through shipment, the sales team can see when shipments of stock are due, what’s on them and their status. Admin and backoffice staff can always see inbound goods, whether they’re on the water or still being processed at the foreign port. Using the data on the shipment, Tall Emu is able to calculate the Landed Cost of your inbound shipments and update the outstanding purchase orders so you always know what has been shipped, received or remains outstanding. The Landed cost calculation apportions freight and duties over the products you’ve brought in to give a true cost. The average landed cost is also updated at this point, and can be updated in your accounting system. Exchange rate calculation is handled automatically. Goods can be receipted into stock with a single click. Confirm quantities and then click to update the stock. It’s now available to sell. Moreover, the release of back-orders can be accomplished with one more click – automatically preparing outbound consignments for your clients once goods are available to sell. Based upon items received and agreed Freight costs and your Purchase Order(s), Tall Emu will calculate the supplier bill. This can be cross-checked against the actual paperwork received from your supplier and then transferred into your accounting system with a single click. If I doubled the size of your sales team would your sales increase? This entry was posted in CRM Intergations, CRM Software Solutions, Tall Emu CRM, What is CRM, Why CRM on August 7, 2014 by Mike Nash. I once had a chat with the owner of a travel agency about how we could help his business become more efficient. 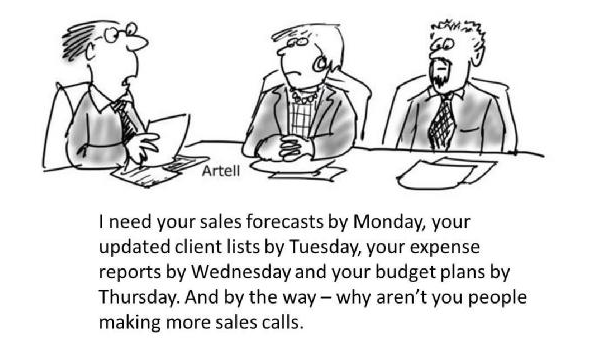 In our meeting he explained his sales team took 15 minutes to work out the itinerary for every lead, and then would call the customer and spend 15 minutes proposing it. He also knew: speed is key. The faster the response, the more likely a deal. This is the sort of challenge we live for here at Tall Emu – by connecting to the travel systems, we could eliminate the 15 minutes of data entry and auto-price the itinerary. This would mean that leads could be handled faster and each salesperson could provide double the number of quotes in an hour. Alternatively, it would be possible to have half the number of sales staff processing the same number of leads. He didn’t get it. I tried another way. “Do you think if I gave you double the amount of sales people, your sales would noticeably increase?” – of course, the answer was yes. “What if I gave you the extra people for free? Would you do it?” – of course he would… but he didn’t. Are you missing similar opportunities in your business? Do you pay your sales team commissions? In one of our clients, a full time staff member was required to calculate the commissions due to them from their clients, as well as those payable to each individual telemarketer. There were 6 sales staff, but it was complex as each employee had a different commission rate per product – as did the company with its clients! We replaced Helen with a button. The button performed all of the calculations in the blink of an eye at 100% accuracy. As the company grew to 100+ staff, the button stayed. Commissions and invoices were still calculated in the blink of an eye – and the company didn’t need to hire another 10 or 20 “Helens” to keep up. Let’s say Helen was paid $20,000 per year. That’s not a bad saving – and that saving grew with the business. I don’t know what happened to Helen[*], but I am reliably informed that the button is still on duty 10 years later. Not a bad return on a $5,000 spend. Do you follow up every lead? Another client had what sounds like the best problem in the world! Too many leads! They’d come in 24/7 into outlook, where the sales team would pounce on them. Then a different member of the sales team would pounce on them. And another. Hours would be spent trying to get in contact with people on the phone, only to be told “Sorry, not really in the market – it just looked cool on TV!”. Meanwhile – real leads and business was slipping through the cracks. Come month’s end hungry salesmen would be trawling through their sent items and copying and pasting emails chasing up quotes. It was manual, paper-based, and uncontrollable. We implemented Tall Emu CRM and centralised everything, starting with lead allocation. Brochures are now created and sent automatically based on current pricing. Each lead is now automatically followed up by email (saving over 10,000 manual email sends and I don’t know how many man-hours per month). The good leads are called. Respondents to emails are quickly allocated to salespeople and called. Everyone is followed up, automatically and once quotes are issued they’re followed up too. Without hiring more staff sales went up. The company is one of our longer term customers, having automated and streamlined many more elements of their business. Do you set targets and report on them ? Management of Targets and KPI’s and associated reporting is often time consuming but every business needs to do it. 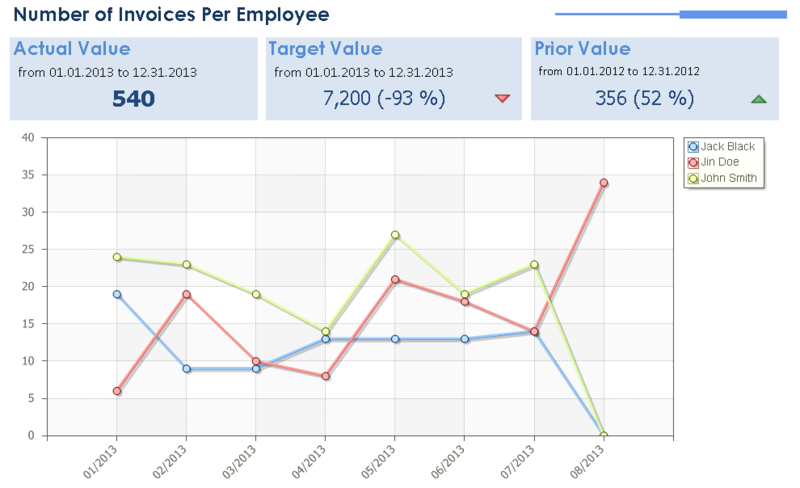 Using Tall Emu CRM we can track every element of the business and set targets using our KPI reporting module. Any KPI you may imagine could be set up, reported on and delivered automatically to your inbox (or dashboard) making performance monitoring automated, efficient and inclusive. We can take this often hated task, automate it and ensure it is done so management has visibility and the sales team aren’t burning time filling out paperwork. There are other examples of efficiency gains. We have implemented automated calculation of trail commission for mortgage brokers, automated credit assessment (and debt collection), integrated with network systems and web based systems- even just exported data for others to use. The point of this post is really to say – take a look at your business. Where are you wasting time? What could be automated? Think about the long term value for your business in getting it right and automated. [*] Actually I do. Helen went back to the UK after her working holiday,but the article reads better how I’ve written it I think.